A Museum Visit For Art Lovers With Alzheimer's At Washington, D.C.'s Kreeger Museum, seniors and students are paired together to enjoy the art — and each other's company. "The goal is to make people feel better and to give them a pleasant experience in the moment. That's all there is, really," says program head Derya Samadi. The Kreeger Museum in Washington, D.C., was once the residence of David Kreeger, former GEICO chairman, and his wife, Carmen Kreeger. It was designed in 1967 by Philip Johnson. The Kreeger is one of several museums in the country that have a special program designed for people with Alzheimer's. Many art lovers feel completely in the moment when they stroll through the galleries of a museum. That feeling was particularly true on a recent morning at the Kreeger Museum in Washington, D.C. The Kreeger runs a special program for people with Alzheimer's — seniors, their caregivers and middle school students are paired together to enjoy the art and one another's company. 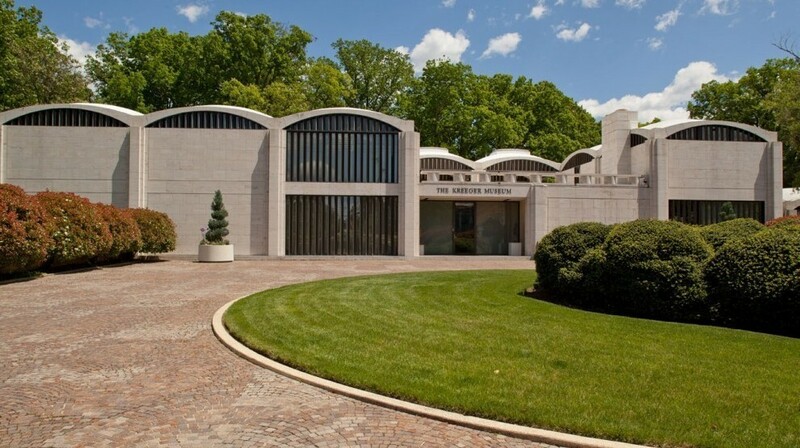 The mansion turned gallery was designed in 1967 by renowned architect Philip Johnson for art collector and philanthropist David Kreeger and his wife, Carmen. The collection includes works by Picasso, Renoir, Arp, Bellows, Albers, Miro, and many others, plus pre-Columbian, Asian and African art — a wide-ranging, personal collection, assembled by the former GEICO chairman and his wife. Recently, small teams of seniors and students from the Holton Arms and Landon schools gathered to discuss three works in the collection: two pieces of sculpture, and Claude Monet's painting Sunset at Pourville. 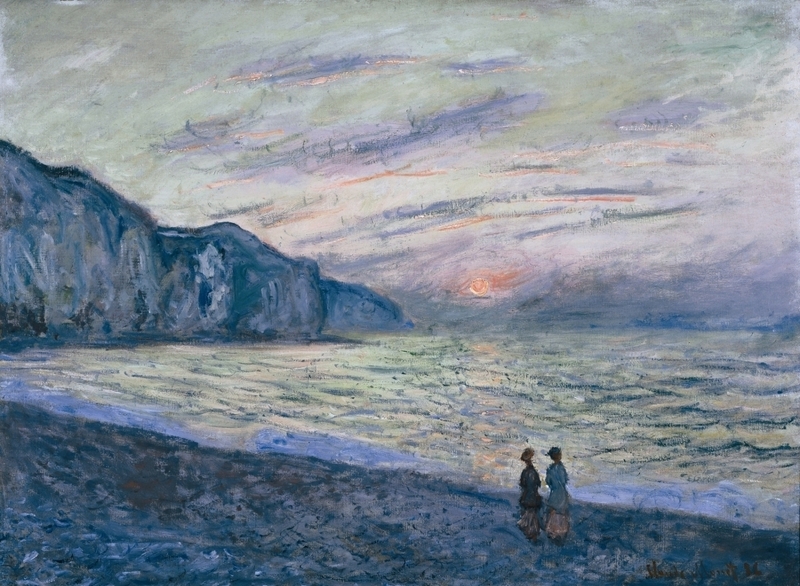 In the Monet canvas, two figures walk along the green-blue pastel beach as the pink sun sets in the distance. "It kind of seems romantic," one student offers. Others say its muted colors are peaceful and luminescent. Students and seniors discussed Claude Monet's Sunset at Pourville during a recent visit to the Kreeger Museum in Washington, D.C.
Barbara Kern asks her husband, Sig Gordon, to imagine himself inside Monet's painting. "Sig, if you were walking there, would you like it there?" she asks. "Oh, yes. Very much so," he answers. Gordon, an art lover in his 70s, found out about the Kreeger program through his Alzheimer's support group. Christina Hogg, a seventh-grader at Holton Arms, asks her senior companion, Hershel Katz, whether he perceives the scene as calm. "Pretty calm," he answers, and adds: "Salty, salty, salty air. Whenever you go to the beach you can go into the sand." A key part of this program is to get the young people interacting with their elders — trying to make connections over art. There are similar programs at other museums around the country. The program at the Kreeger runs four times a month, with some 10 or so participants at each session. Derya Samadi, who runs the Kreeger's Alzheimer's program, says art museums have always been places of refuge and stimulation for her, and they serve the same purpose for men and women with Alzheimer's. "There's something about being in the stimulating environment," Samadi says. "It's there for them; they haven't lost it. They just can't connect to it. So you're just trying to open up channels for them." The goal is to make people feel better and to give them a pleasant experience in the moment. That's all there is, really. The group sits quietly. Some engage with the poem; others look around the room. Hershel Katz's wife, Linda, says she likes the last line of Frost's poem: Into the future. Let what will be, be. "We have to remember that what's going to be is going to be," she says. "This is a very accepting picture. It's just this moment in time and it's all very beautiful." Appreciating the present. Facing the future. These are both themes of the Kreeger program. "The goal is to make people feel better and to give them a pleasant experience in the moment. That's all there is, really," Samadi says. The presence of the young people seems to make the moments more vivid. The students are very outgoing and eager. After they sign up for the Kreeger program, they get hourlong training sessions at their schools — they learn how to reach out, how to repeat their words if they aren't understood — or remembered — the first time, how to help people feel comfortable. "I have some relatives who've had Alzheimer's and it runs in families," says Holton Arms student Christina Hogg. "My brother's actually mentally disabled," explains sixth-grader Spencer Davis. "So I thought it'd be nice to get to know people who have trouble with things sometimes and get their perspectives." Davis' brother is 18 and unable to talk. The visit with people living with Alzheimer's shows Spencer that even though his brother has different problems, he's not alone. "Sometimes it's hard to be with him 'cause I can't really do much with him," Davis admits, "but being here with these people, I realize it's not so different being with him. It's just harder to communicate with him." He says his day at the Kreeger made him think his brother might enjoy visiting a museum. "I think it'd be nice to see how he reacts to the art," Spencer says. This day with art, at the former home of an insurance company mogul and his wife, is full of lessons for its visitors, young and old. Samadi appreciates all the interactions — but she's also a realist. She knows that 10 minutes after they leave the Kreeger, the participants with Alzheimer's may not remember what happened at the museum. "But they can still have their mood improved even if they don't remember," she says. "It's not a cure for the disease, but it makes people feel better and there are some connections. People are shut down, and they start talking." And it's true: Two men, who began the morning with polite smiles and vacant eyes, gradually started connecting with the Kreeger conversations, adding thoughts and becoming energized. It was good to see — for however long it lasted.